Have you ever imagined what it’s like to be living onboard out at sea for 10 days and doing nothing but just diving? If that’s the kind of vacation you want, then head out to Costa Cocos. Cocos island, which is the right word to use, is an offshore Pacific Island located 550 kilometers (340 miles) west of mainland Costa Rica. It has become an exclusive haven for scuba diving where the treasure it holds beneath has amazed divers from all parts of the globe. With over 10 dive sites scattered around the island, you will have at least one site per day to explore wherein each of these sites has something in common: they are swarmed with hammerhead sharks. While it seems scary to be surrounded by hammerhead sharks where attacks have been reported in some countries, they seem to be calm and relax here in Cocos island. Let’s take the case of Bajo Alcyone which is considered the top dive site in Cocos island and the best spot to view patrolling hammerhead sharks. When you descend to this offshore seamount, you will notice that the behavior of hammerhead sharks is not that aggressive, but rather subtle. This is due to the fact that they are about to be cleaned. Yes, they are here to visit one of the many cleaning stations usually located on the reef ledge where your viewing deck is just located a few meters away. While kneeling on the reef ledge, your initial sighting of hammerhead sharks will come out from the open seas where their tight school forms the so-called “wall of sharks”. Some of these sharks will continue their patrolling cruise while some of them will come close to the reef to get cleaned. Cleaner fish, like the barberfish, keeps the cleaning station on the go where they take off parasites and dead cells from the shark’s skin. If you are lucky, you can see 5 or more sharks being cleaned simultaneously. Other species of shark can also be found in Cocos island. 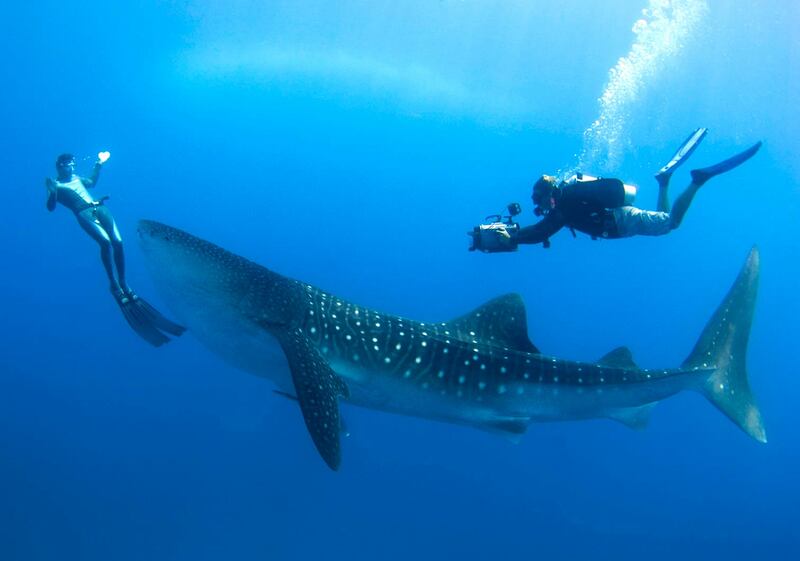 In fact, the existence of these sharks has become the signature experience for a dive site. If you happen to explore the rocky protrusions in the northern coast called Manuelita, you will notice that the shallow reefs are dominated by inactive whitetip reef sharks. While this may sound boring, wait until darkness sets in and go night diving with the now highly active whitetips. Another signature species that you can interact in Cocos island can be found in the northeastern reefs called Silverado. This shallow water dive allows you to come face to face with the fast and swift-moving silvertip sharks. The good thing with Cocos island is that your underwater interaction will not be limited to sharks alone. This offshore Costa Rican island has been considered as a top spot for big fish interaction where other large marine creatures abound the area. For example, and the most obvious, is the great school of jacks where their tightly-knit population can comprise of up to a thousand fish that swirls around like a tornado. A lot of other magnificent sea creatures that are relatively huge but harmless can be considered as the icing on the cake where you can further interact with manta rays and whalesharks towards the end of each dive. If the dive sites around Cocos island doesn’t fill the brim of your diving satisfaction, then diving deeper in the abyss will. But how is this possible since we have depth limitations set under the Standards for recreational scuba diving? For you to explore the abyss, you really don’t need to go scuba diving. Instead, you will be diving using a deep-sea submersible where you can plunge down up to 300 meters (1,000 feet) deep without getting wet. During the initial stage of this deep-sea journey, you will see all the marine life that you have already interacted in your previous dives plus you will have a panoramic view of the shallow reefs. But as you further go down, the radiance of sunlight will start to fade and you will realize that you have already entered a new zone where oddly-looking creature are now the subject of your interaction. Some of the creatures that you will see are jelly nose fish, red-lipped batfish and the highly elusive prickly shark. We know that you are wondering what’s at stake if you set foot on the island. Let’s make it this way: a day of setting foot on the island would satisfy the trip but would leave you wondering for the rest of the trip after hearing stories of how this island became legendary. Your daytrip to the island will not be like a beach-goer’s itinerary. Instead, it will be a combination of historical walk and nature tour. Arriving at the shoreline, instead of taking a dip, you will be attracted to the stone carvings that are scattered along the coast. These carvings are not ancient but have been made by individuals who have been to the island a long time ago. When you arrive at the ranger station, you cannot get rid of asking who made those carvings. The answer park rangers will tell you will be in a form of pirate stories and explorers who once have been to the island. On your way up following a hiking trail, park rangers will tell you about stories of great pirate treasures hidden somewhere in the island. As your interest in the story grows, you will realize that you have already entered a tropical rainforest where tree canopies have already blocked the rays of the tropical sun. On your way down, you will never miss one of the many virgin waterfalls that can be found in the entire island. While taking a dip at the refreshing fresh water, you can’t help but think: how about if I find that lost treasure myself? Well, sad to say, treasure hunting as well as overnight staying in the island is now strictly prohibited. And so, does the building of any tourism facility like hotels and resorts. Before you can see and enjoy all this beauty nature has given to Cocos island, you first need to sign-up with a liveaboard cruise. Knowing all the restrictions, as the island is now declared a National Marine Park, there’s no other way but to live out at sea onboard a custom-built ship call liveaboards. If you are expecting that the word “comfort” is not applicable for 10 days while you are living onboard at sea, then the spacious and air-conditioned cabins with its own private bathroom would change your mind. In fact, mini-luxury would be the right term for this trip. Now, here’s the thing: if you want to experience all the above-mentioned description including the deep-sea submersible, then we highly suggest that you book with the Undersea Hunter Group as this is the only tour company offering this once in a lifetime get-away. For more information, you can read our related article about Costa Cocos.